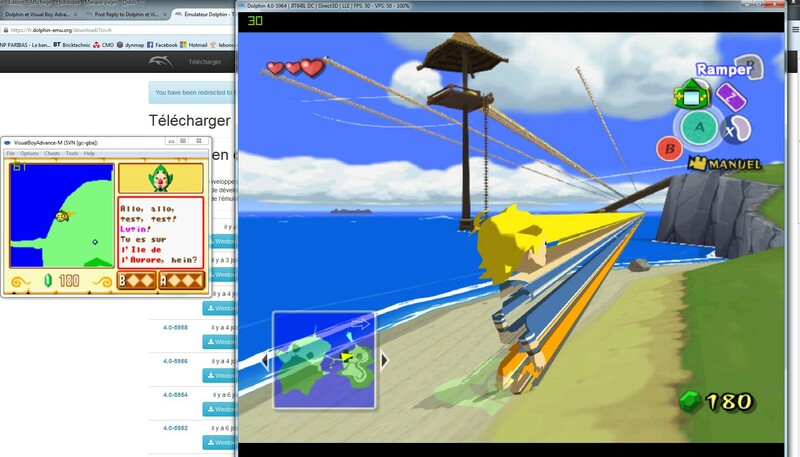 J'ai ressorti un vieux classique de la GC, LOZ The Wind Waker, et j'ai voulu le ré-utiliser sur la wii, manque de bol, ma Wii ne veut plus lire les jeux de GC. alors comme mon pc avait eu une bonne upgrade, je vais lancer dolphin, et j'ai voulu utiliser le poste de tingle, avec Visual Boy Advance-M, bien configurer selon pas mal de tuto, puisque le jeu détecte la gba, mais le problème vient de VBA qui tourne a 0FPS, et qui donc ne peut pas afficher le jeu. Par contre, dès que je coupe dolphin, VBA repasse en vitesse normale. j'ai essayé de jouer avec les types de mémoire différent, mais impossible de faire quoique ce soit. avec Sims Permis De Sortir et LOE Four Swords, c'est pareil. avez vous une idée de ce que je peux faire ? I took out again an old classic of the GC, LOZ The Wind Waker, and I wanted to reuse it on the wii, no luck, my Wii does not want to read any more the games of GC. Then as my pc had had a good upgrade, I am going to launch dolphin, and I wanted to use the Tingle Tuner, with Visual Boy Advance-M, well to configure according to not bad of tuto, because the game detects the gba, but the problem comes from VBA who turns has 0FPS, and who can't show the game. On the other hand, as soon as I cut dolphin, VBA goes back quickly normal. I tried to play with different memory, but impossible to make although it is. With Sims Permis De Sortir and LOE Four Swords, it is similar. Have you an idea of what I can do ? i have read this: "4.0-5899 - Update GameCube to GBA Link Emulation and VBA-M r1235 - Preliminary Update for GameCube to GBA Emulation by skidau"
(04-05-2015, 04:24 PM)sshikamaru Wrote: the problem comes from VBA who turns has 0FPS, and who can't show the game. On the other hand, as soon as I cut dolphin, VBA goes back quickly normal. In VBA-M, have you disabled Options > Emulator > "Pause when inactive" ? Have you loaded the GBA BIOS? Have you selected GBA under Controller Settings? (04-06-2015, 06:43 AM)skid Wrote: In VBA-M, have you disabled Options > Emulator > "Pause when inactive" ? Have you loaded the GBA BIOS? Have you selected GBA under Controller Settings? How cow. What Nvidia Driver are you on?